We are excited to bring to our community this new web site. It has been specifically designed to fit the needs and provide information for the citizens and businesses of Clayton County in regards to the services that we provide to you as your fire department. ReadyClayton – These pages have a wealth of information from our Emergency Management division about how to plan and be prepared for a diverse range of emergencies. The Organization page displays how the Fire Chief and all the “command staff” divide the many duties that the fire department takes care of. You can see who is filling each role, read their biography, and the check out details of what they oversee. Ever wondered what it takes to become a firefighter? Check out this page for details on what our recruits go through to prepare them to be a Clayton County firefighter. To learn about how long the Clayton County Fire Department has been around, and how we have grown, check out CCFES History page. 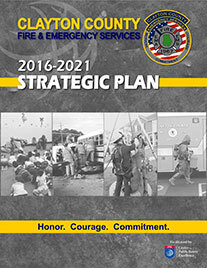 Please also check out our Strategic Plan below. This is a document that provides short-term direction, builds a shared vision, documents goals and objectives, and optimizes use of resources to offer a road map for a justifiable and sustainable future.